NEW YORK (WABC) -- The New York Rangers are eagerly awaiting the return of Mika Zibanejad, whose absence has been felt in the team's lineup. Since the center suffered a concussion on November 24th, the Blueshirts' power play has taken a steep hit. Friday night the Rangers managed to go 1 for 3 on the man advantage, but since the injury have gone from 5th in the league in that category to 25th. The timetable for Zibanejad's return is uncertain at best. Prior to Friday night's contest against Los Angeles, Rangers head coach Alain Vignault said; "He's following the protocol, he skated on his own yesterday. He's improving...we've got a practice on Monday and he'll practice with us." Without Zibanejad the Rangers power play has gone 3 for 22, a stark drop off from earlier this season when the team started building chemistry. The Rangers have yet to fill the void left by him down the middle. At the time of the injury he was the team's top goal scorer with 11, and top point leader with 22. 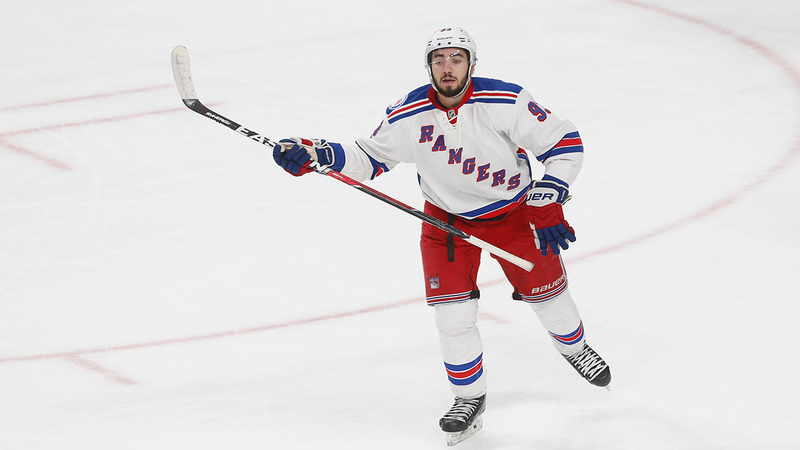 Zibanejad also was on New York's number one line with Chris Kreider and Pavel Buchnevich on the wings. Friday night's 4-2 victory over Los Angeles makes the Rangers 6-3-1 in their last 10 contests, good for 4th in the Metropolitan Division. They look to carry that momentum into Boston Saturday in an Original Six matchup. Face-off is set for 5 p.m. at TD Garden in Boston.